Nominated for a Chickadee Award from the Maine Children's Choice Picture Book Project, 2004-2005. Colorfully illustrated by Elbrite Brown. My Family Plays Music was inspired when my son, then three years old, asked me why he had a babysitter every Friday and Saturday night. 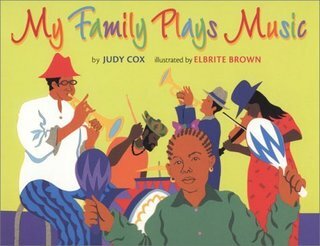 He didn’t really understand when I explained that both his mom and dad played in a band on weekends, so I wrote this book to describe the joys of belonging to a musical family.